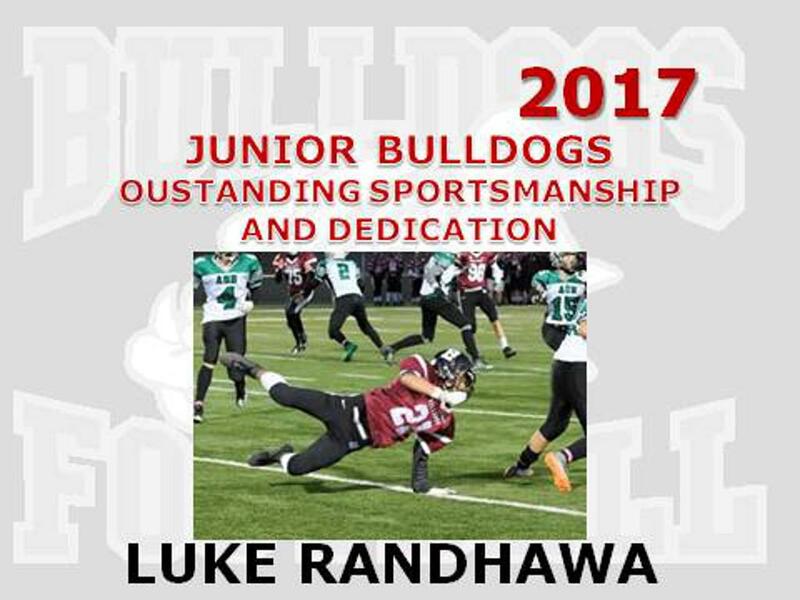 CONGRATULATIONS TO ALL OF OUR AWARD WINNERS FOR 2017 ON BOTH THE JUNIOR AND SENIOR BULLDOG TEAMS. AN OUTSTANDING YEAR FOR ALL AND WE HOPE YOU ENJOYED THE 2017 SEASON. 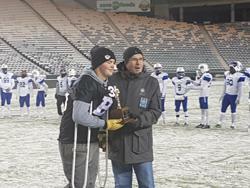 Our Coach O recognized by Global TV Edmonton as this weeks MVP. Click on the link to watch the video. On Sunday, May 21 at the Football Alberta Bantam Bowl banquet our own Larry (Coach O) Olexiuk will be inducted into the Football Alberta Life Membership/Hall of Fame. 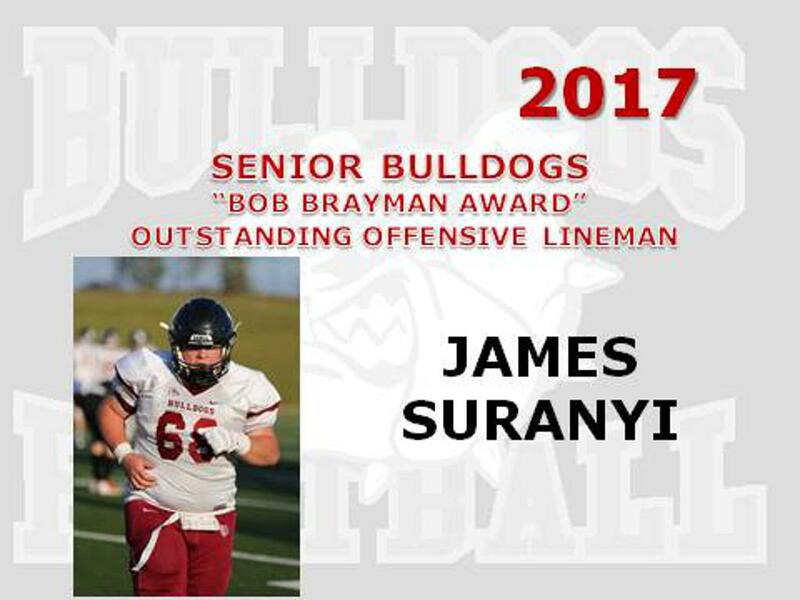 Larry's accomplishments listed below in the Football Alberta press release speak for themselves, but his passion and genuine devotion to the Bulldogs Football program is second to none. 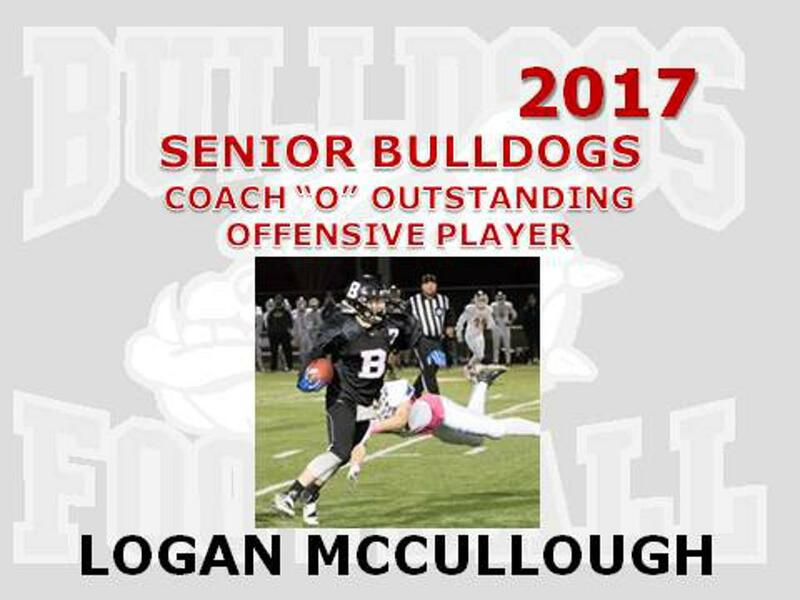 We at Bulldogs Football are proud to have such a distinguished and true gentleman teaching our boys how to become men first, and football players second. Please join us in congratulating Coach O! Larry Olexiuk’s involvement in football stretches back to 1967 with his first year of coaching the offense with the Jasper Place Bantam Lions. A year later he became the head coach of the Palmer 49er’s Bantam team in St. Albert and began a close to 50 year love affair with football in that city. Over the years, Larry was instrumental in coaching at all levels of the game in St. Albert and also supported the Edmonton District Bantam Football Association as head coach of their all-star team in 1986 and 1987. His most important role in St. Albert was as the main driver for the creation and initial funding of the St. Albert High School Football Association in 1986. Prior to that players had to leave the city to play high school football. Since that time the high school situation has grown from one senior team to football at all three high schools in St. Albert. Thanks to Larry over 200 young men get to play high school football in their hometown each season. Very deserving of the Life Membership/Hall of Fame award. 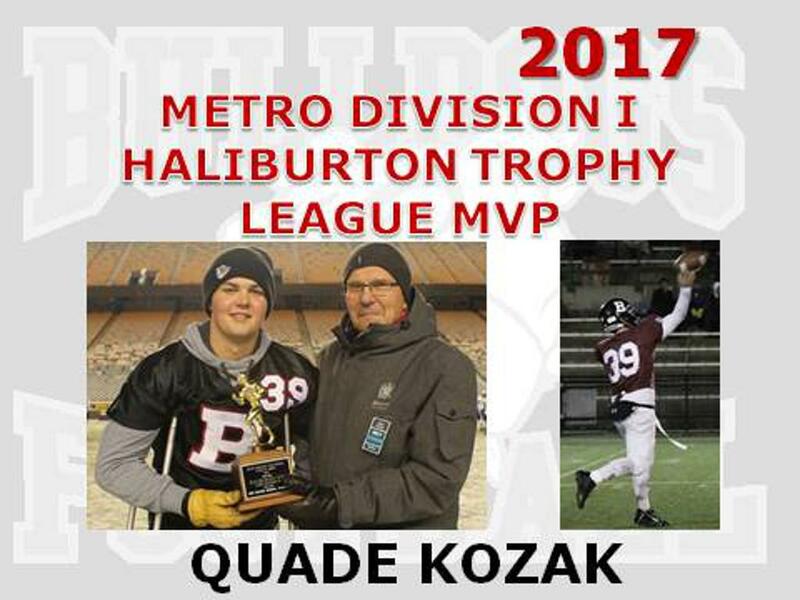 Congratulations to QB Quade Kozak voted by Metro League Carr Conference Division I coaches as the league MVP! 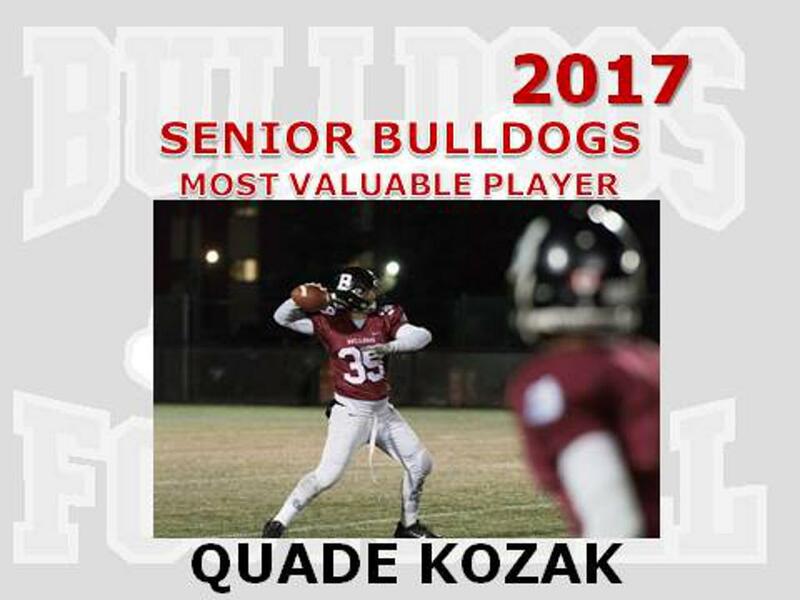 Quade had his amazing season cut short in the Carr Conference Division I semi-final with an injury but his stats for the season and his leadership on the field speak for his nomination and being voted as the league MVP. PASSING - 189 Passes attempted, 117 Completions for 1868 Yards 61.9% completion percentage. 18 TD, 6 Int. PUNTING - 46 Punts - 1673 Yards - 36.4 Yd Avg. The Bellerose Bulldogs are playing their best football when it matters the most. The division one Carr conference team won two straight before wrapping up the metro Edmonton regular season Friday against the Jasper Place Rebels on Senior Night at Larry Olexiuk Field. The score was unavailable at press time. A victory against the Rebels (0-5) should secure the sixth and last playoff spot for Bellerose after losing three in a row by a combined score of 139-11. 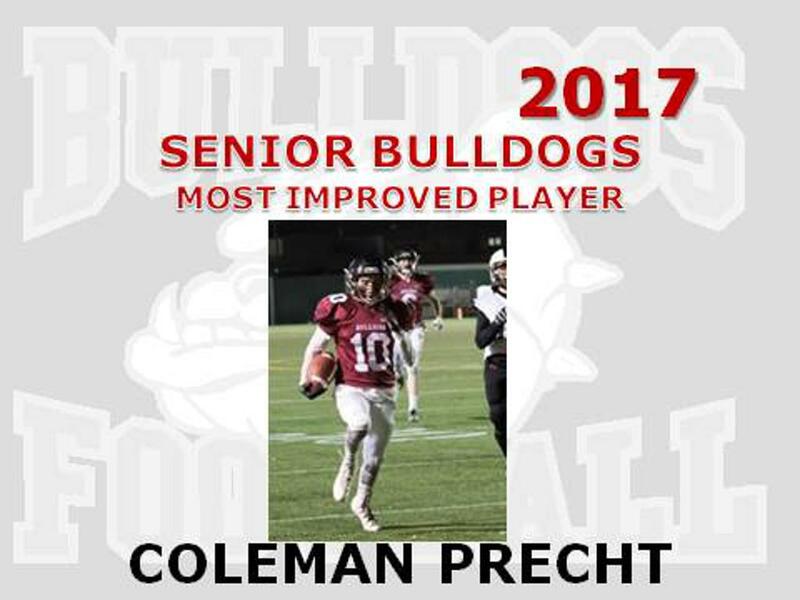 “We’re just tired of losing, honestly,” said Brett Yost, a Grade 12 running back and returnee from last year’s 7-4 Bulldogs as the Carr finalists and Tier I north provincial finalists on the team’s turnaround. Jason Lafferty, the new head coach at Bellerose, wasn’t discouraged over the three losses to kick off the season. “I knew this was going to be a challenge and I was excited for it,” said Lafferty, prior to Thursday’s practice in preparation for the Rebels. “Everyone here relishes the challenge each day and every game and we have another challenge this week with JP. I know they’re going to come out flying. They’re a tough physical team historically. It’s been a work in progress for Bellerose to start bringing it at this stage in the season. “Obviously it takes time to gel as a team. The guys are buying in to the message from the coaching staff and executing what we’re asking them to execute,” Lafferty said. “Jared (Koziol) is playing extremely well at the quarterback position. We’ve got defensive guys playing well. All the kids are playing well. There were no pity parties for Bellerose while suffering losses of 31-9 against the Ross Sheppard Thunderbirds (3-2), 77-0 against the Harry Ainlay Titans (4-0), last year’s Carr and Alberta Bowl Tier I champions, and 31-2 against the Spruce Grove Panthers (3-3). “Nobody is going to feel sorry for you when you’re 0-3. Nobody, me included. I’m not going to feel sorry for myself. I’m not going to change my coaching philosophy. I’m not going to change how I talk to these kids, the academic standards that we have here or the demands we’re placing on them from a school perspective,” said Lafferty of the senior team’s young lineup and small roster of players. As for the winning streak, “We made the most of our opportunities when we got them,” Lafferty said. “We played hard. They did what they were asked and they executed at a very high level in all phases of the game. Tinkering with the game plan also put Bellerose over the top against Facey and Strathcona. Yost’s three-yard touchdown run and Mohammad Zeidan’s conversion opened the scoring against Facey, plus two safeties and Zeidan’s 18-yard field goal produced all the points Bellerose needed against the Sherwood Park team. It was 14-2 at halftime and there was no scoring in the fourth quarter. Yost gobbled up 123 yards on 23 carries and caught five passes for 61 yards. Koziol was 10-for-18 passing for 138 yards and was intercepted once. Cory Hannam picked off two passes and Cole Precht and Pablo Rizzi-Benavides pulled off one interception apiece. Rizzi-Benavides also led the defence in tackles with seven. Strathcona, the 2017 division one Miles conference champion, led 9-0 in the first quarter and 16-7 in the second quarter and tied the match at 23 in the third quarter with a 68-yard pick-six. Two of the biggest plays in the comeback victory for Bellerose was Shane Loewen’s 90-yard catch and run TD before quarter time in the first and Caleb Akerley’s 20-yard TD reception to put the Bulldogs ahead for good in the third quarter. “We knew they weren’t going to be an easy team to beat and when they got those points up on us we were in the huddle and we just kept saying, ‘Keep on fighting guys. The game is not over. There is tons of time left,’” Yost said. “When Shane had that amazing catch, that kind of flipped the momentum around in our favour and we bounced right back. Koziol also teamed up with Adam Rafat for a 56-yard TD before the third quarter ended and Zeidan’s fourth conversion ended the scoring. Koziol completed 12 of 17 passes for 388 yards and was intercepted twice. 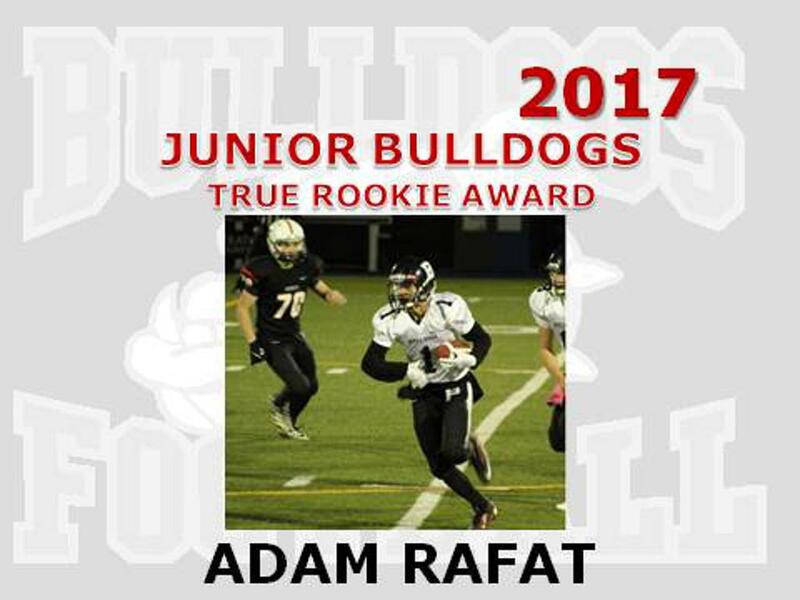 Rafat was the leading receiver with six catches for 171 yards. Bronson Wilke was credited with a team-high 10 tackles and Ashton Drew had nine. Liam Birch and Kyle Anderson also registered one QB sack apiece. Yost gained 100 yards on 27 carries while scoring TDs on runs of seven yards in the second quarter and from the two in the third quarter, followed by the two-point conversion reception to make it 23-16 Bellerose to start the second half. 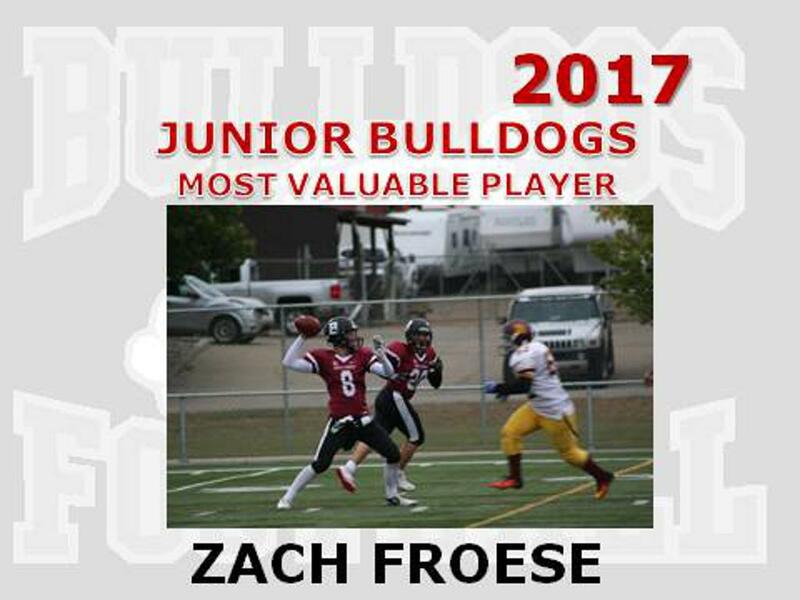 After five games, Yost produced 297 rushing yards on 79 carries and next closest Bulldog is Gage Froese with 24 yards on five handoffs. “It was a little frustrating the first three games, we were just trying to click, but ever since then the O-line has played phenomenally and I couldn’t have done it without those guys. 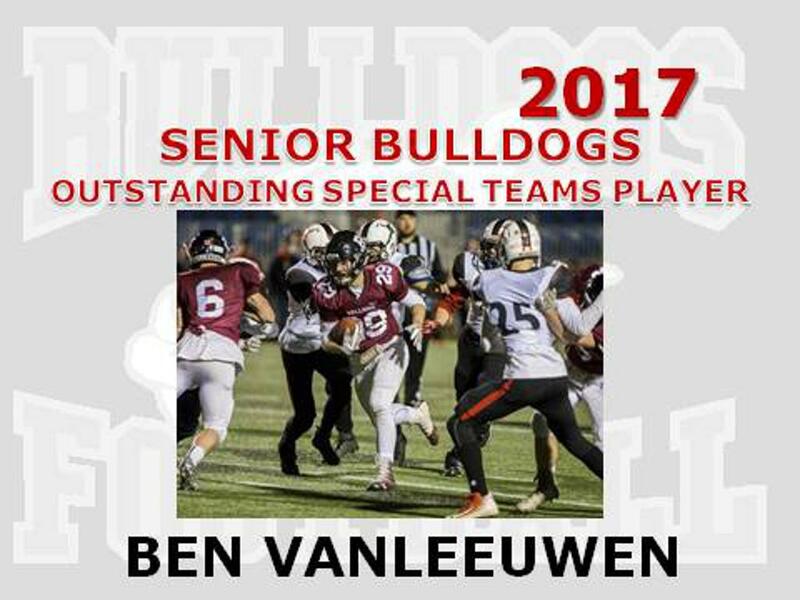 The five O-linemen we have, they’re absolutely amazing setting up the blocks for me and that’s why I’m getting those yards,” said Yost, a defensive stalwart last year who also served as Ben VanLeeuwen’s backup before he opened eyes while running to daylight with the midget spring league St. Albert Storm this season. “It was time to shine in the spring with the Storm and the main thing was just getting the confidence built up,” said Yost, who filled in on defence for a couple of plays against Strathcona but is slickly an offensive player this year. 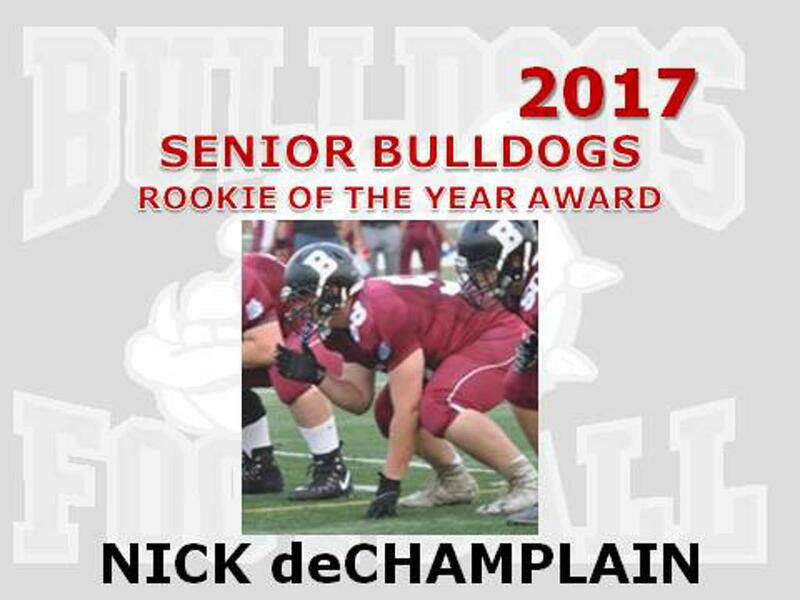 “I had a great season with the Storm and then I just brought all the skills and all that stuff from the Storm into Bulldogs’ spring camp. I had a pretty good spring camp and tried to bring that into the fall. The Bellerose Bulldogs are poised to huddle up in the division one Carr conference playoffs after knocking off the Strathcona Lords 37-23 in Friday’s must-win game at Foote Field. The outcome left the Bulldogs and Lords tied at 2-3 for the sixth and final playoff berth with one game remaining in league play. Friday the Bulldogs host the Jasper Place Rebels (0-5) on Senior Night at Larry Olexiuk Field and the Lords line up against the Ross Sheppard Thunderbirds (3-2) at Emerald Hills. Kickoff times are 7:30 p.m. The top two teams have first-round byes when the metro Edmonton playoffs start Oct. 26. The second win in a row by the Bulldogs was a come-from-behind effort. Down 9-0 in the first quarter and 16-7 in the second quarter, the Bulldogs jumped ahead on Brett Yost’s two-yard touchdown run and two-point conversion catch from quarterback Jared Koziol for the 23-16 lead in the third quarter. After the Lords tied it up at 23 with a 68-yard pick-six, Koziol completed TD passes of 20 yards to Caleb Akerley and 56 yards to Adam Rafat. Mohammad Zeidan converted both majors as well as Koziol to Shane Loewen 90-yard TD in the first quarter and Yost’s eight-yard TD in the second quarter. Zeidan also added a single point before halftime. Koziol completed 12 of 17 passes for 388 yards and was picked off twice. Rafat caught six passes for 171 yards, Loewen registered 125 yards on two receptions and Akerly snagged two passes for 79 yards. Yost gained 100 yards on 27 carries. Bronson Wilke led the defence with 10 tackles and Ashton Drew had nine. Liam Birch and Kyle Anderson also recorded QB sacks. The Lords, last year’s division two Miles conference champions, returned a fumble 83 yards and the conversion made it 16-7 in the second quarter. 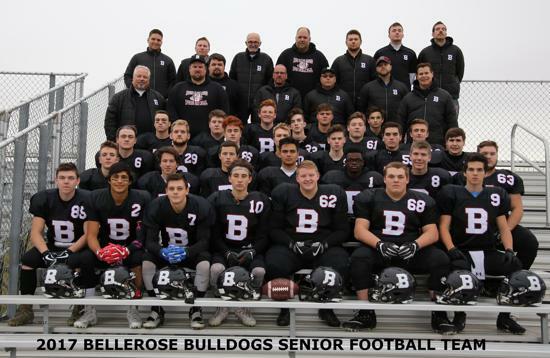 Tuesday’s metro Edmonton division one junior semifinal between the Bellerose Bulldogs and Salisbury Sabres kicks off at 7:30 p.m. at Clarke Stadium. The Bulldogs (5-1-1) and Salisbury (5-2) finished second and third, respectively, in the eight-team standings. The Bulldogs beat Salisbury 33-29 in league play Oct. 24 in Sherwood Park. At halftime the Bulldogs led 27-0. The winner plays the Jasper Place Rebels (6-1), the defending champions, or Harry Ainlay Titans (4-2-1) in the Nov. 14 final. 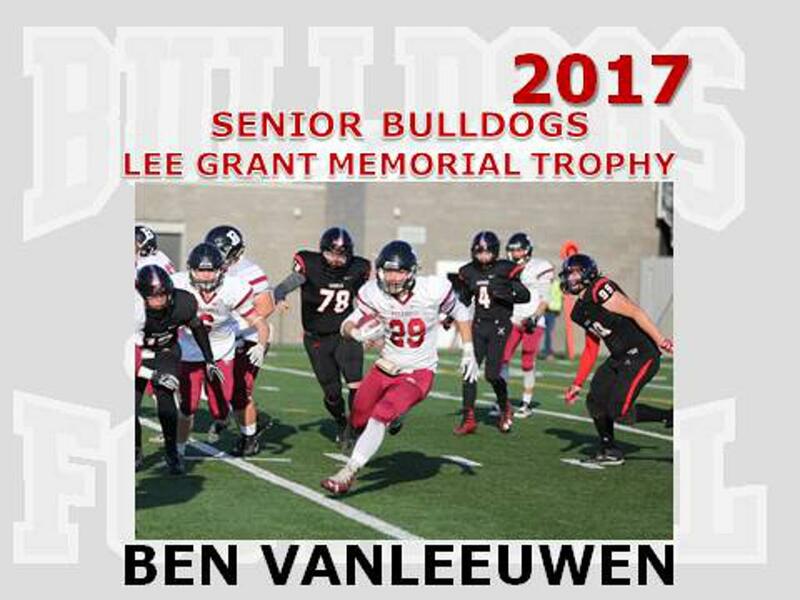 Last year’s 27-11 loss in the division one semifinals to the Rebels ended an undefeated run of four consecutive undefeated championship seasons for the Bulldogs. 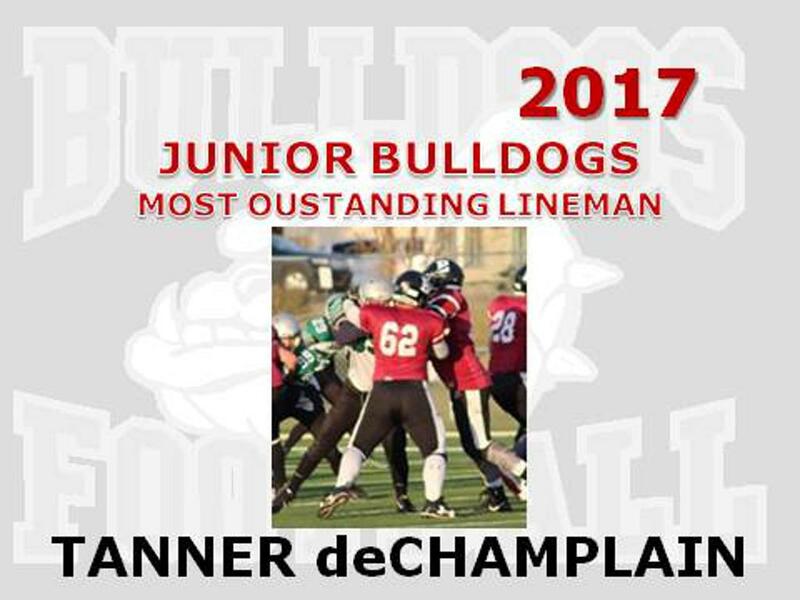 The Bulldogs are 39-2-1 in league and playoff action since losing the 2011 semifinal after Monday’s 62-15 rampage against the Ross Sheppard Thunderbirds (0-7). The Bulldogs cruised to leads of 39-6 at the end of the first quarter and 52-6 at halftime. Jakob Kikkert scored on the first play from scrimmage on a 65-yard run. Shep answered with a long run but the convert was no good. 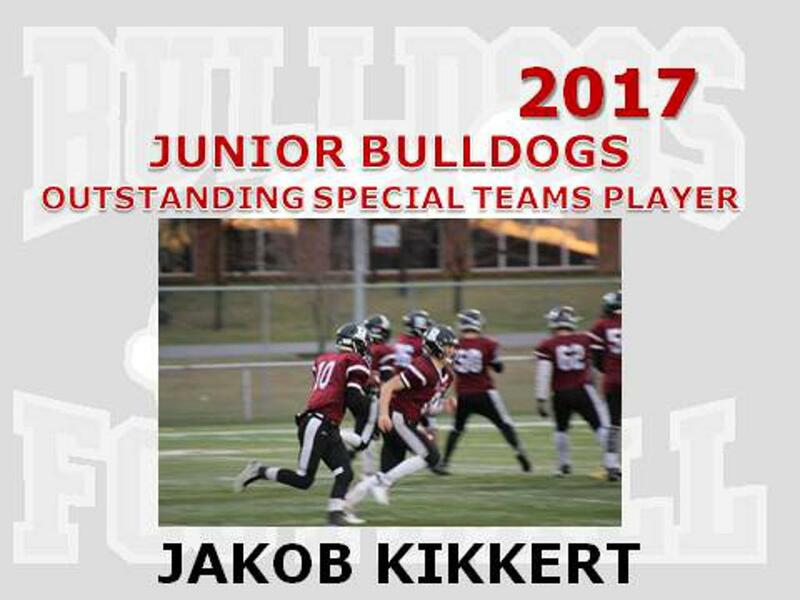 The ensuing kick-off was returned by Kikkert 75 yards to the house. The next TD was Zach Froese’s quarterback designed run of 44 yards and the rout was on. Froese connected with Ethan Mickleborough on a 30-yard catch and run TD and Dylan Young’s one-yard TD burst was set-up by Adam Rafat’s reception from Froese. Ethan Engele and Denes Demeter took over the QB duties for the last three quarters as the Bulldogs emptied the bench. Jordan Howe pulled off a pick-six, Engele hooked up with Rafat on a 40-yard TD strike and Gage Froese ran in a two-point conversion. Howe also returned an interception for a TD but it was called back because of an iffy illegal block. That set up Kikkert’s third TD on a short completion by Demeter. Shep aired the ball out for a long TD, followed by the two-point conversion and then got a single off the kick-off. A suspect holding penalty wiped out Will Baker’s 75-yard TD on a trick play. Adam Rafat was a touchdown machine with four scores as the Bellerose Bulldogs stomped the Austin O’Brien Crusaders 41-0 Tuesday in metro Edmonton junior football. Zach Froese and Jordan Howe also produced TDs as the Bulldogs improved to 2-0-1. The junior Dawgs led by 20 points at halftime and running time started in the third quarter as the Crusaders (2-1) struggled to stop the Big Three on the Bellerose offence. Rafat is the team leader in TDs with eight while Froese, the quarterback, has rushed for three majors and Howe has four TDs. Up next is Tuesday’s tilt with the Jasper Place Rebels (2-1). Kickoff is 7:30 p.m. at Johnny Bright Park. 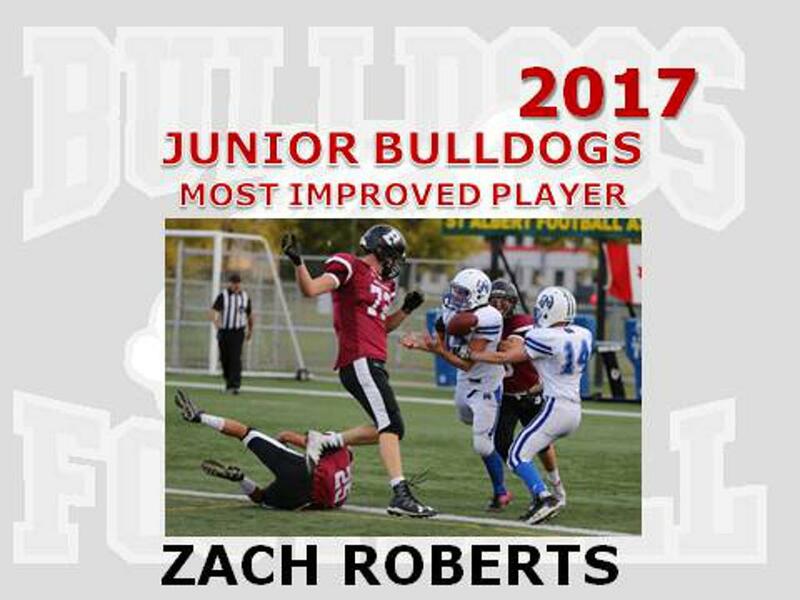 Last year’s 27-11 loss to the Rebels in the division one semifinal ended a spectacular run of four undefeated championship seasons in a row for the Bulldogs. The only high school junior football team in St. Albert is 36-1-1 in league and playoffs combined since losing the 2011 semifinal. A tie was better than a loss for the Bellerose Bulldogs in high school junior football. The Bulldogs are 1-0-1 after clawing back to even the score at 28 against the Harry Ainlay Titans on Tuesday night at Larry Olexiuk Field. 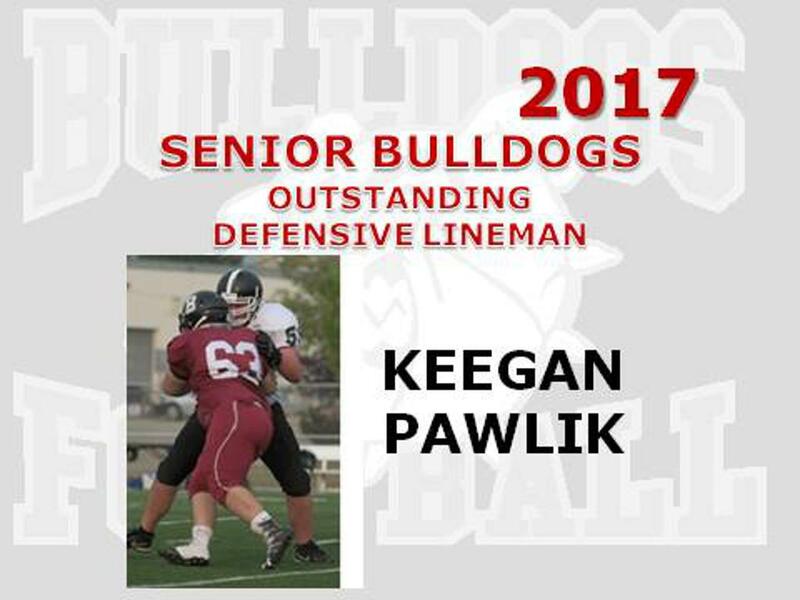 The Bulldogs shook off a 14-point deficit in the third quarter with Howe and quarterback Zach Froese scoring touchdowns and Adam Rafat’s two-point conversion. “We made a great comeback,” Howe said. “We couldn’t take an L against these guys because our senior team lost pretty bad to them (44-14 in the division one Carr conference) so we had to prove that we can do better. 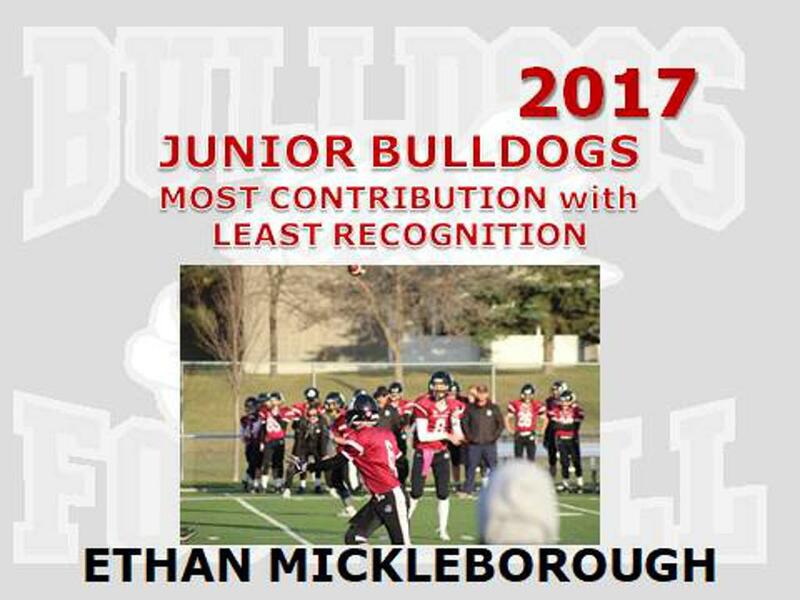 The Bulldogs have yet to lose a regular season contest during a 35-1-1 stretch that started in 2012 and included last year’s 27-11 loss to the Jasper Place Rebels in the division one semifinals that ended a run of four junior playoff championships in a row and one short of the metro Edmonton league record. The Bulldogs got off on the wrong foot while falling behind 21-14 at halftime. The team’s first TD was a four-yard run by Froese early in the second quarter and the convert was no good. With one second left in the half, Howe was on the receiving end of a TD pass from Froese on the five-yard curl into the endzone. Froese and Ethan Mickleborough also combined on the two-point conversion. Down 28-14, Howe turned on the jets during a blazing 60-yard catch and run with Froese pulling the trigger and the convert was unsuccessful. 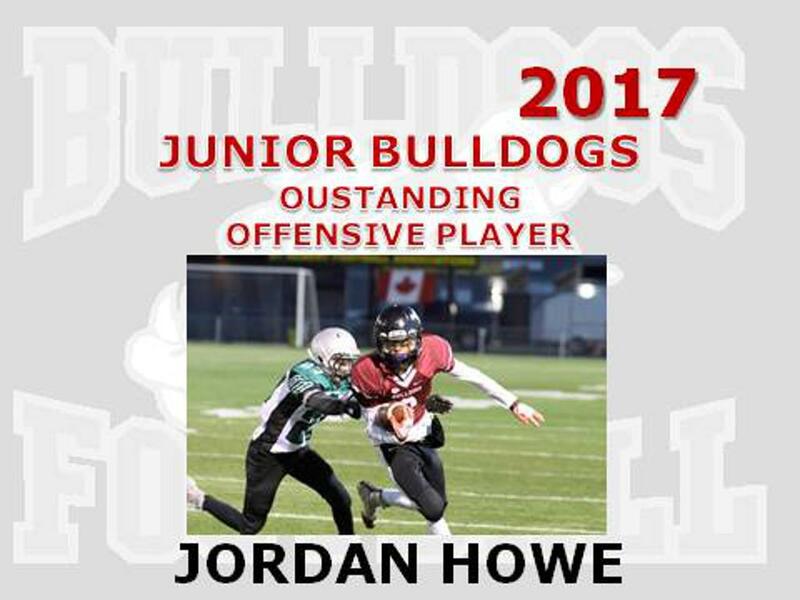 The Bulldogs tied it up with Froese’s quarterback sneak after Howe was stopped short of the goal line and Rafat ran in the two-point conversion on a jet sweep play. The Bulldogs kicked off the season with a bang by blasting the O’Leary Spartans (0-2) 47-7 before buckling down against a formidable foe in the Titans (1-0-1). “It was a better game because O’Leary wasn’t as strong as a team as Harry Ainlay so it was good competition. Now we know what we’re facing so we’ve got to come better prepared next time,” said Howe, 15, a bantam product of the St. Albert Fury. Tuesday the Bulldogs tackle the Austin O’Brien Crusaders (2-0) at 6 p.m. at Larry Olexiuk Field. The top four finishers in the eight-team division qualify for the division one semifinals and the rest of the teams compete for division two honours. Congratulations to #6 Matt Coogan, LB and #68 James Suranyi, OL for making the 2018 Senior Bowl All-Star Roster. Matt and James will compete in the 2018 Senior Bowl on Monday May 21, 2018 at Foote Field in Edmonton. 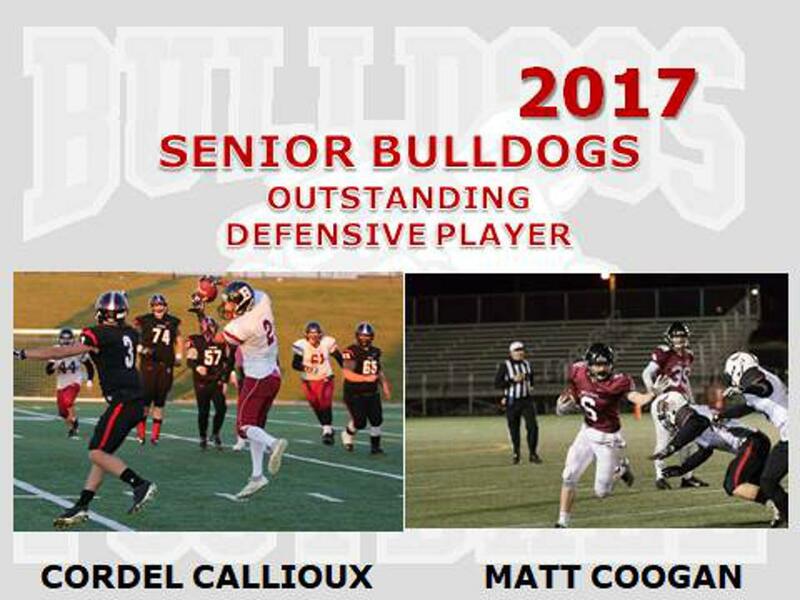 A shout out to 9 of our Bulldogs players who were voted by the Metro Carr Division I Coaches as Metro Athletics All Edmonton All-Stars. Please note, coaches are not allowed to vote for their own players so this is recognition by our competitors. 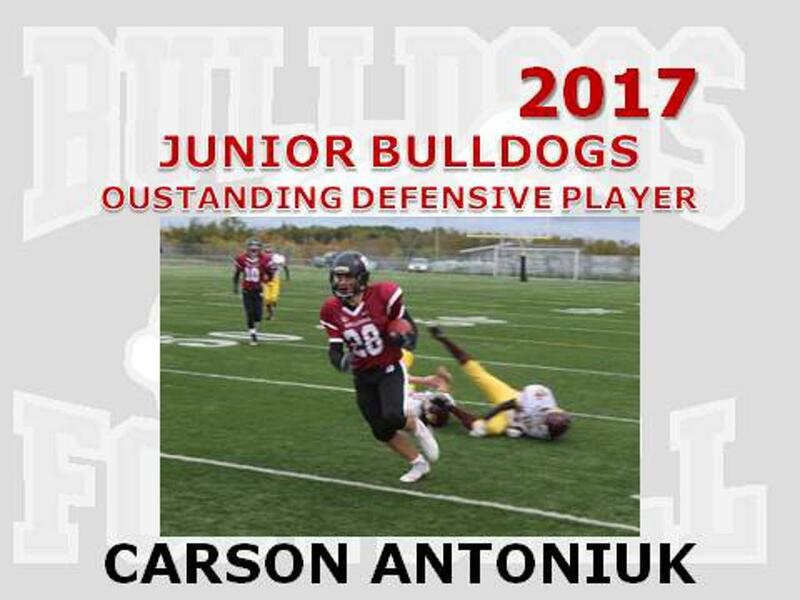 2017 All-Edmonton Carr Division I Players from Bellerose Bulldogs. 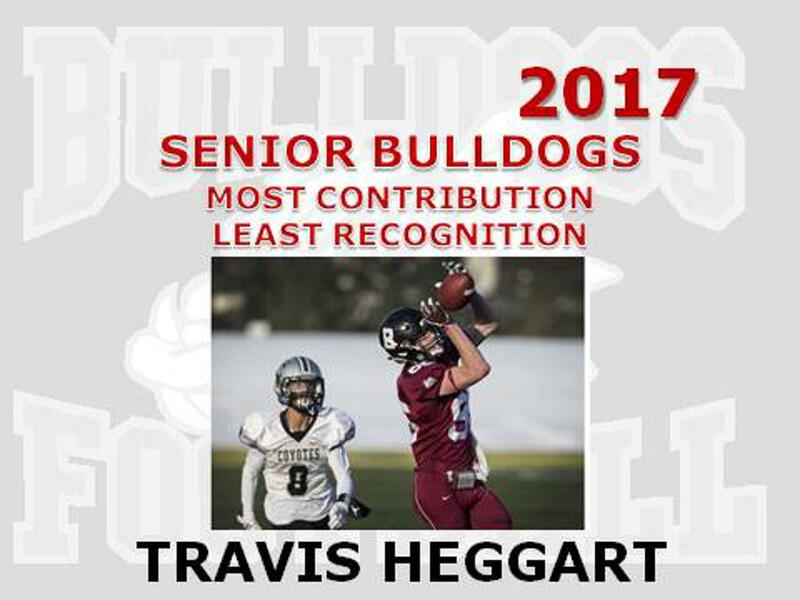 9 Players from the Bulldogs is the most from any team in the Carr Conference in 2017. Congratulations to these players for their well-deserved recognition. 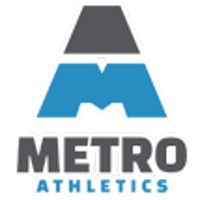 Please see the document listed below for the actual announcement by Metro Athletics and All-Stars from all 3 Football Divisions.